HungryMan and I have been supporting Netflix since 2001. It single-handedly eliminated the video rental battles that were characteristic of movie dates in the early stages of our relationship. Previous to 2001, we would arrive at the video store with a fairly good idea of what we were going to rent that night. However, once HungryMan walked in the store and saw the endless possiblities he became paralized by the indecision. He would walk about the store with two to four DVD’s in his hands while surveying at all the other options. I would get tired of waiting, sit on the floor, and pout. Really, it was a great way to start a date night. So when we received the Netflix flyer in our mailbox, it was love at first sight. While we do agree on Netflix, our tastes in movies still swing in varying directions. We each put our requests in the queue and watch whatever DVD comes in the mail. I think you are capable of assessing who chose what. As for what we’re going to watch tonight, that remains to be seen. Ok, let me tell you….Mr. Marvelous and I are the same. It would go something like….. HOWEVER, Rachel, have you SEEN the newest Die Hard? Oh. MY. GOSH!! SO GOOD! Funny post. And your blog time must have been increased. You’ve been posting quite often lately. Please don’t teach your actions to your daughter! No worries Mike, we won’t let Ava see the action flick. Oh how Mark & I are SO similar. Trips to the video store have historically NOT been successful for us. I like Pride & Prejudice and Disney movies…he likes movies about wars or vampires. I think I’m going to have to write a blog about our movie adventures one of these days. 🙂 Although I did shock him (and myself) by disclosing that I sort of want to see “Hellboy 2”! I kind of liked the trailer I saw and then read in World Magazine that it’s a “borderline family movie”. So…he may be swaying me. Yikes. p.s. What is “Sweet Land”? Is that good? 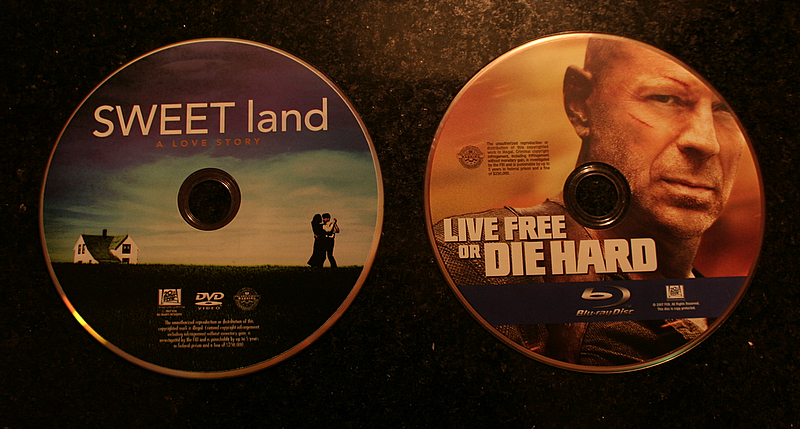 Sweet Land, I thought, was a really good movie. Rachel, what did you think about it?